Council, in partnership with VicRoads, has engaged GTA Consultants Pty Ltd to undertake an investigation study into the upgrade of Ford Road (between the Goulburn Valley Highway and Grahamvale Road). VicRoads also engaged GTA Consultants Pty Ltd to undertake a similar investigation study for Wanganui Road (between Golf Drive and Goulburn Valley Highway). The findings of the two studies were integrated to form the Draft Wanganui Road and Ford Road, Shepparton: Feasibility Study Design Report 2018 (Draft Report). The principle of the use of Ford and Wanganui Roads as the direct connection between the Stage 1 of the Bypass and the Shepparton Alternate Route (Grahamvale Road and Doyles Road) has been established in Council policy for some time. The Draft Report determines how these roads will be designed to cater for increases in car and heavy vehicle use, including exploring the options and constraints to upgrading these roads. At the Ordinary Council Meeting held on 20 February 2018, Council resolved to endorse the Draft Report and to release it for public comment for a period of eight weeks, commencing on 26 February 2018 and concluding on 23 April 2018. In 2006, Amendment C33 to the Greater Shepparton Planning Scheme applied a Public Acquisition Overlay (PAO) to the land identified for the preferred Goulburn Valley Highway Shepparton Bypass (Bypass) alignment. The full 36km four lane Bypass is estimated to cost just over $1.3 billion. VicRoads has since acquired a number of land holdings along the route. Given the significant cost involved in realising the project, Council adopted a five stage approach to delivering the Bypass at the Ordinary Council Meeting held on 17 May 2016. Stage 1 of the Bypass is the current priority – a single lane carriageway in each direction extending from the Midland Highway and Excelsior Avenue intersection to the west of Mooroopna to the Goulburn Valley Highway in Shepparton North – a total distance of 10.05kms. In recognition of the importance of Stage 1 of the Bypass to Shepparton and Mooroopna, VicRoads received $10.2 million in funding from the Victorian Government, to take forward design and early works for Stage 1 of the Bypass. When Stage 1 of the Bypass is constructed, Ford Road and Wanganui Road will become a key east-west link providing a direct connection between Stage 1 of the Bypass and the Shepparton Alternate Route (Grahamvale Road and Doyles Road) for traffic moving west-east and west-south. It will also help to realise a freight supply chain network around Mooroopna and Shepparton. Ford Road and Wanganui Roads were identified in the Greater Shepparton Freight and Land Use Study as the best option to realise a direct connection between the Goulburn Valley Highway and the Shepparton Alternate Route. This Strategy was adopted by Council in 2013. 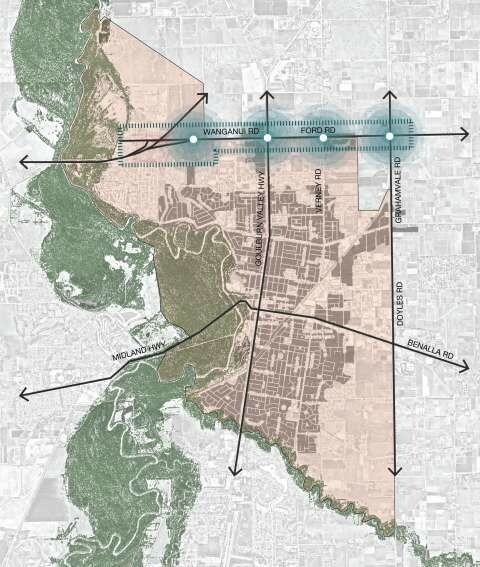 However, the idea has a long history, and a proposal to use Wanganui Road and Ford Road as such a direct connection was included in the Greater Shepparton 2030 Strategy Plan in 2006. Council is aware that there are many residential properties along Ford and Wanganui Roads that may be impacted to some degree by the proposed upgrade and sought to understand the design constraints and any issues that the upgrade may raise for local residents and businesses. Council wrote to 700 land owners and occupiers of land along Ford and Wanganui Roads in April and May 2017, inviting interested parties to attend drop-in sessions. The purpose of these one-to-one workshops was to ensure that all issues associated with any future upgrade of Ford and Wanganui Roads were known, and that the scope of the investigation was thorough and robust. 30 people attended the Ford Road workshop held on 19 April 2017 and provided comments from Linda Court, Rosina Court, Matilda Drive, Jersey Crescent, Ryeland Drive, Holstein Court, Ayrshire Way, Ann Wood Nook, Botany Crescent and Mootwingee Crescent. A similar exercise was undertaken for Wanganui Road in May 2017 and a drop-in session held on 7 June 2017. Freight operators were also invited to attend these workshops. an acoustic assessment of the entire route. This assessment has informed the final design treatments. 16 pre-draft submissions were received by Council up to December 2017. The majority of these submissions were identical and objected to Ford Road serving as an arterial east-west link. One submission supported the realisation of an arterial east-west link along Ford Road given the critical need to connect Stage 1 of the Shepparton Bypass with the Shepparton Alternate Route. GTA Consultants Pty Ltd has completed the Draft Report, taking into consideration the issues identified during the consultation phase, as well as the findings and recommendations included in the additional assessments. Ford and Grahamvale Roads as a roundabout. includes a landscape master plan for the ultimate design of the entire route. It is important to note that the investigation study is not a review of alignment options for an east-west route. As discussed previously, the use of Ford and Wanganui Roads as the direct connection between Stage 1 of the Bypass and the Shepparton Alternate Route (Grahamvale Road and Doyles Road) is adopted Council policy. improve freight efficiencies for operators to strengthen their sustainability and provide opportunities for future economic prosperity. upgrade Ford Road to support its ongoing role and function as a key east-west connection. The Draft Report estimates the total cost for all works required to allow Ford and Wanganui Roads to act as an arterial east-west link to be $100.64 million. There are no firm plans or a confirmed timescale for any upgrade of Ford and Wanganui Road. Any future upgrade is likely to be dependent upon securing funding for Stage 1 of the Bypass. During the consultation period held from 23 February to 23 April 2018, Council received a number of enquiries and submissions that requested Council to investigate alternative alignments to realise the east-west link. In response to these requests, Council followed up with consultation to consider the opportunities and constraints of these community-suggested alternative alignments. 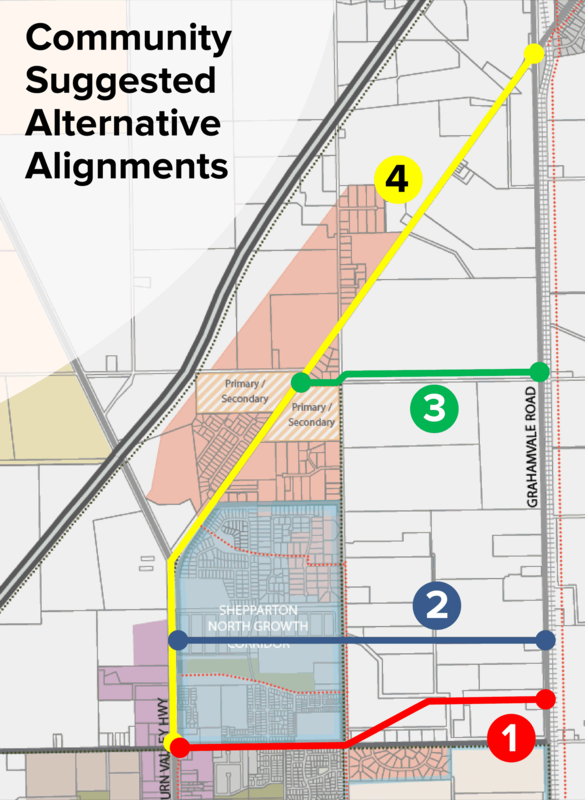 Letters to land owners immediately adjacent to these four community-suggested alternative alignments were sent in early May, and Council invited all land owners to provide feedback on these alternative alignments. One-to-one workshops with land owners along these alternative alignments were held in March 2018 to meet with Council officers and GTA Consultants Pty Ltd, to discuss any concerns. Following this further consultation period, Council officers and VicRoads reviewed all feedback, comments and submissions received both following the draft consultation phase of the Draft Wanganui Road and Ford Road Shepparton Feasibility Study Design Report 2018 (held earlier this year), and the current targeted consultation with land owners adjacent to the four community-suggested alternative alignments. Based on the feedback received, Council is continuing to work with GTA Consultants Pty Ltd and RRV to finalise the updated Draft Report. At the same time, RRV is completing further planning studies on the wider-Shepparton road network to help inform the ultimate design for Ford and Wanganui Roads. A critical component of these planning studies is the completion of an updated traffic model. This information will allow an updated Draft Report to be finalised later in 2019. Whilst Council is considering the opportunities and constraints of the alternative alignments, Council will also continue to engage with those submitters who raised issues, such as safety, acoustic measures, intersection treatments, turning lanes, etc. during the draft consultation phase held earlier this year. Why is this work being done? Ford Road and Wanganui Roads were identified in the Greater Shepparton Freight and Land Use Study 2013 as the best option to realise a direct connection between the Goulburn Valley Highway and the Shepparton Alternate Route (Doyles and Grahamvale Roads). This Strategy was adopted by Council in 2013. However, the idea has a long history, and a proposal to use Wanganui Road and Ford Road as such a direct connection was included in the Greater Shepparton 2030 Strategy Plan in 2006. What is the road going to look like when it is completed? The roads will be designed to provide a connection between the Bypass and the Shepparton Alternate Route for cars and heavy vehicles. However the road has been designed to cater for all road users with the introduction of a shared path for cyclists and pedestrians to the north of the route and a separate footpath to the south. This will enhance community connectivity within the entire area. Further to this, a landscape master plan has been prepared for the entire route. The Landscape Master Plan prioritises the integration of public spaces with private spaces, provides for water sensitive urban design and assists in achieving the vision outlined in the Urban Forest Strategy 2017. What is actually being done to the cross section for Ford Road? There are two distinct cross sections proposed for Ford Road that seek to increase the existing road reserve width from 20 metres to 25.4 metres and 27.4 metres. The additional 5.4 metres and 7.4 metres would be achieved by acquiring land to the north of Ford Road. The 25.4 metre cross section applies to the western half of Ford Road between Verney and Grahamvale Roads. The 27.4 metres cross section applies to the eastern half of Ford Road between Verney and Grahamvale Roads, and the entire section from the Goulburn Valley Highway to Verney Road. What is actually being done to the cross section for Wanganui Road? In contrast, cross section proposed for Wanganui Road seeks to increase the existing road reserve width from 20 metres to 33.6 metres. The additional 13.6 metres would be achieved by acquiring land to the north of Wanganui Road. 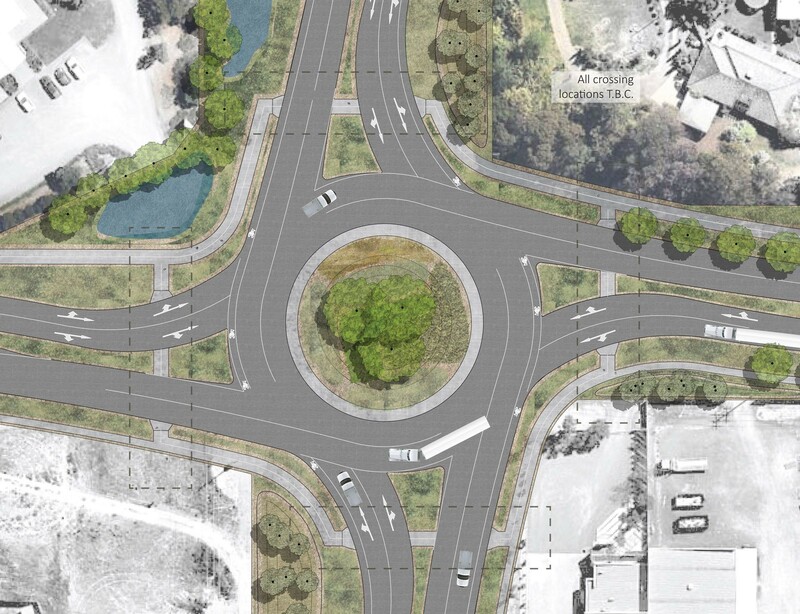 How many vehicles will use Wanganui Road and Ford Road once the bypass is in place? Traffic modelling indicates that the highest use of the roads will be following the construction of Stage 1 of the Bypass. The modelling indicates that Wanganui Road will see a significant increase from around 2,200 vehicle movements each day, of which around 100 are heavy vehicles, to around 10,000 vehicles, of which around 1,100 would be heavy vehicles. Ford Road sees a more modest increase from current levels of around 3,000 vehicles, of which 400 are heavy vehicles, to 5,000 vehicles, of which 600 would be heavy vehicles. However, once all future stages of the Bypass extending are complete from Toolamba to Congupna traffic volumes will be significantly less. What are the local benefits? The road will be upgraded to provide a landscaped boulevard which will provide an enhanced amenity for the area. The works will ensure the segregation of various modes of transport, which will improve the safety of the road for all users and will provide for sheltered right-hand turn lanes for safe turning movements. The proposal would include improved drainage infrastructure and would safeguard yet-to-be developed land along Ford Road. This is dependent on decisions and funding by the Victorian government, which Council anticipates to be some time during 2019-2021. Council expects the upgrade works to then be undertaken in preparation for Stage 1 of the Bypass. How long will the road works take? It is uncertain at this early stage and the duration of works will depend on the final agreed scope of works. Will Wanganui Road or Ford Road be closed during the construction / will the road be open at any time? Council will aim to ensure that the roads will be open to traffic during the works; however, residents should expect delays due to works potentially reducing the road to one lane. Pedestrian access will be provided during the works; however, its location may alter as the works progress. What will happen to the trees? Council and VicRoads both have policies to maintain trees wherever possible and Council has recently adopted the Urban Forest Strategy 2017-2037 to increase the street trees across Greater Shepparton. A landscape masterplan has been prepared for the entire route. The Landscape Master Plan prioritises the integration of public spaces with private spaces, provides for water sensitive urban design and assists in achieving the vision outlined in the Urban Forest Strategy 2017.
Who should I contact to discuss the works or ask questions? For further information please contact Ronan Murphy, Senior Strategic Planner, Greater Shepparton City Council on (03) 5832 9730.